BEIJING — A detained Swedish bookseller at the center of an escalating row between Western governments and China has accused Sweden of using him as a "chess piece" in a media appearance arranged by Chinese police. Gui Minhai, a Hong Kong-based publisher who sold books of salacious gossip about Chinese leaders, told several outlets including the South China Morning Post on Friday that he never wanted to leave China and that Stockholm has been using his case to "create trouble" for China's government. The statement from Gui, who spoke in a detention facility flanked by police, was immediately denounced by rights activists as coerced. In putting Gui before the press this week, Chinese state security appeared to be responding to Swedish Foreign Minister Margot Wallstrom, who on Monday sharply questioned the rule of law in China and blasted Beijing's "brutal" treatment of Gui after weeks of relatively mild pleas for his release. Gui was seized in January by 10 plainclothes agents while traveling by train with Swedish diplomats. Sweden said its officials were taking him to seek medical treatment. In a 20-minute appearance on Friday, Gui told reporters that officials in Sweden had "sensationalized" his case for political purposes ahead of this year's general election, according to the Post. The newspaper said it was approached by China's Ministry of Public Security about an interview on Wednesday — a day after Wallstrom's statement — and it agreed to take part, provided that it could ask any questions it wanted. "Looking back, I might have become Sweden's chess piece. I broke the law again under their instigation," Gui was quoted by the Post as saying. "My wonderful life has been ruined and I would never trust the Swedish ever again." The Swedish foreign ministry said in an email that "Sweden has acted strictly in accordance with basic international rules on consular support." "We continue to demand that our citizen be given the opportunity to meet with Swedish diplomatic and medical staff, and that he be released so that he can be reunited with his daughter and family," it said. Patric Nilsson, a foreign ministry spokesman, told Swedish media on Friday that Gui's comments would not sway Sweden's calls for his release, which have been echoed by Germany, the European Union and the United States. "We have a clear demand that he be set free, so that he can meet his family," Nilsson told the TT news agency. "Those demands remain." Police in the eastern Chinese city of Ningbo, where Gui was released into house arrest in October, did not respond to a fax seeking comment. But earlier in the week, China's foreign ministry heavily criticized Sweden for advocating on Gui's behalf and warned against efforts to interfere in Chinese judicial matters. It is not the first time Gui, 53, has been detained by Chinese authorities, nor is it his first interview conducted in Chinese captivity. He was believed to have been abducted by Chinese agents for the first time in 2015 from his seaside home in Thailand. At the time, speculation swirled in publishing circles that Gui was on the verge of releasing a new book about the personal lives of top Chinese leaders, explaining the all-out efforts to silence him. 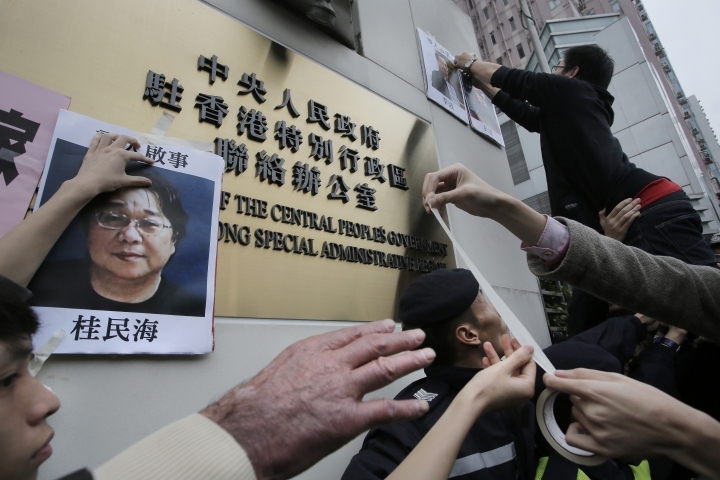 Several of Gui's colleagues from his Hong Kong publishing house also went missing in quick succession, sparking street protests in Hong Kong against what was widely viewed to be efforts by mainland security forces to snuff out independent voices in the semi-autonomous city. Gui was released into house arrest after Chinese authorities said he turned himself in over a hit-and-run accident allegedly committed years before. Gui's overseas friends and family, including his daughter Angela, say that the charges were bogus and that Gui was keen to leave China for Europe. But in his interview Friday, Gui told reporters he was in fact living happily in Ningbo and playing mahjong with his mother several months ago when Swedish officials exaggerated the diagnosis of a muscular ailment and convinced him that he should return to Sweden as soon as possible to seek treatment for a severe neurological disease. He eventually "fell for it," he explained, while adding that he was not allowed to leave the country because he was still under investigation for conducting illegal business. "I have seen through the Swedish government," he said. "I may consider giving up my Swedish citizenship." Gui's case has deeply frustrated Western governments who say they had assurances early this year from China's foreign ministry that Gui's liberty had been restored and that Gui's seizure in January in full view of Swedish consular officials came as a shock. Although Chinese authorities have long pressed dissidents for confessions, Gui's latest interview adds to a growing pattern in recent years of the government using high-profile political detainees and state-controlled or sympathetic press to directly rebut criticism. In some instances, detainees, including a Swedish human rights activist and one of Gui's colleagues, have recanted their jailhouse confessions aired by the state broadcaster CCTV as soon as they left China. Gui previously issued a televised confession while in detention in 2016, telling CCTV that he was being legally held for his traffic violation and was "willing to accept any punishment." "In yet another embarrassing move, #China is forcing Swedish citizen #GuiMinhai to 'confess' and make public statements," Mans Molander, Sweden and Denmark director of Human Rights Watch, said on Twitter Friday. "We have seen it before."